Please join host His Excellency Ambassador Jose Manuel G. Romualdez & staff for a fascinating evening at the Historic Chancery. The Ambassador will review various aspects of history, culture, business, economics, politics and major issues of his nation, as well as the opportunities and challenges that lie ahead. Following comments, attendees will be able to ask questions and meet with members of the embassy staff. The reception will include a nice assortment of Filipino food and beverages. To view the brief video with the highlights of the evening and what this nation offers, CLICK HERE. When: Wednesday, January 23, 2019, 6:30-8:30 pm (Inclement weather date TBA). Parking: Free, on-street parking after 6:30 p.m. Regular Members & Guests: Early Bird through 1/14: $29/person. NOTE: RESERVE EARLY, as our Embassy events usually reach capacity. Reservations: Required in advance. NO WALK-INS. Your name, position, organization, and other registration information will be collected by the Club and provided to the Embassy for security reasons, as we hope you can understand. You can provide needed information under "Special Instructions" when you register. Limited capacity: Total of 50 people, subject to availability. --8:00-8:30 p.m.: Continuation of reception, meeting with Ambassador and other officials. Click here to make your reservations!!! "It is with great honor and a deep sense of responsibility that the Embassy accepts this solemn charge today of preserving the history, nationalism, and dignity that this buildingembodies for the people of the Philippines." 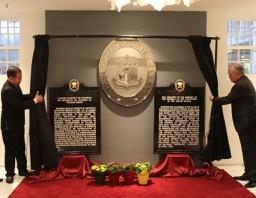 Thus declared Philippine Ambassador to the United States Jose Manuel G. omualdez at the formal ceremony on 9 November 2018 dedicating the Old Chancery of the Philippine Embassy in Washington, D.C. as a National Historical Landmark of the Philippines. Two historical markers, one in Filipino and another in English, were also unveiled at the ceremony. "As a people with a deep sense of nostalgia, Filipinos will ever be mindful of the hard work of our for efathers that have taken us to where we are today in 2018. We shall do what we can to protect and safeguard it with honor. And this building, this National Historical Landmark, no doubt, will constantly remind us of our sacred charge,and of our solemn responsibility," Ambassador Romualdez added. Purchased in 1941, it was in the Old Chancery on 1617 Massachusetts Avenue NW, Washington D.C., where Resident Commissioners Joaquin M. Elizalde and Carlos P. Romulo presided over the transition of the Philippines from being a Commonwealth into an independent republic in 1946. For a time during World War II, the building was also the headquarters of the Philippine Commonwealth Government-in-Exile. To view the brief video with the highlights of what this nation offers, CLICK HERE. 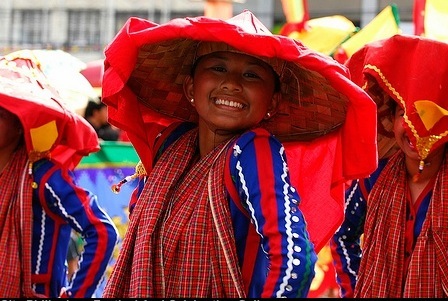 The Philippines are the third largest English speaking country in the world. They have a rich history combining Asian, European, and American influences. Prior to Spanish colonization in 1521, the Filipinos had a rich culture and were trading with the Chinese and the Japanese. Spain's colonization brought about the construction of Intamuros in 1571, a "Walled City" comprised of European buildings and churches, replicated in different parts of the archipelago. In 1898, after 350 years and 300 rebellions, the Filipinos, with leaders like Jose Rizal and Emilio Aguinaldo, succeeded in winning their independence. In 1898, the Philippines became the first and only colony of the United States. Following the Philippine-American War, the United States brought widespread education to the islands. Filipinos fought alongside Americans during World War II, particularly at the famous battles of Bataan and Corregidor, which delayed the Japanese advance and saved Australia. They then waged a guerilla war against the Japanese from 1941 to 1945. The Philippines regained its independence in 1946. Filipinos are a freedom-loving people, having waged two peaceful, bloodless revolutions against what were perceived as corrupt regimes. The Philippines have a vibrant democracy, as evidenced by 12 English national newspapers, 7 national television stations, hundreds of cable TV stations, and 2,000 radio stations. Filipinos are a fun-loving people. Throughout the islands, there are fiestas celebrated everyday and foreign guests are always welcome to their homes. 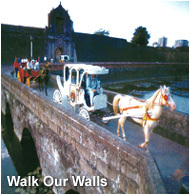 Their tourism theme reflects this: "It's More Fun in the Philippines." The Filipino is basically of Malay stock with a sprinkling of Chinese, American, Spanish, and Arab blood. The Philippines have a population of over 100 milion as of 2018, and it is hard to distinguish accurately the lines between stocks. From a long history of Western colonial rule, interspersed with the visits of merchants and traders, evolved a people of a unique blend of east and west, both in appearance and culture. The Filipino character is actually a little bit of all the cultures put together. The bayanihan or spirit of kinship and camaraderie that Filipinos are famous for is said to be taken from Malay forefathers. The close family relations are said to have been inherited from the Chinese. The piousness comes from the Spaniards who introduced Christianity in the 16th century. Hospitality is a common denominator in the Filipino character and this is what distinguishes the Filipino. Filipinos are probably one of the few, if not the only, English-proficient Oriental people today. Pilipino is the official national language, with English considered as the country's unofficial one. The Philippines (Filipino: Pilipinas), officially the Republic of the Philippines (Republika ng Pilipinas; RP), is an archipelagic nation located in Southeast Asia, with Manila as its capital city. The Philippine archipelago comprises 7,107 islands in the western Pacific Ocean, bordering countries such as Indonesia, Malaysia, Palau and the Republic of China, although it is the only Southeast Asian country to share no land borders with its neighbors. The Philippines is the world's 12th most populous country with a population over 100 million. Patriotic Song "Pilipinas Kong Mahal", "Bayan Ko"
Wander over the world heritage site, Banaue Rice Terraces, Eighth Wonder of the World, carved from the high Cordilleras over 2,000 years ago. Behold the 500-year old mummies in Kabayan. Follow the steps of President Gloria Macapagal Arroyo trekking up Mt. Pinatubo. View Taal Volcano, the smallest volcano in the world. Head for the 1,268 Chocolate Hills of Bohol. Top off your experience with an exhilirating ride on a canoe down an 8-kilometer Underground River in Sabang, Puerto Princesa City, Palawan. More and more people are discovering that the Philippines is Asia’s most inexpensive shopping destination where you can get the most value for your money. Here you can find imported name brands from the West, as well as products handcrafted in the Philippines, from weaves, baskets, and brassware to hand-embroidered piña cloth, wood figurines, and all sorts of custom-made furniture, clothes, wedding gowns, shoes, embroidery items, and many other accessories. The world's longest underground river system accessible to man is located in the capital of Palawan. The Puerto Princesa Subterranean River National Park, which has been inscribed in UNESCO’s World Heritage List, is Palawan's most popular attraction and covers 5,349 hectares of lush forest, dark mountains, caves, and white beaches. Paddle through eight kilometers of a snaking, underground river leading to a clear lagoon. Walk on the Monkey Trail, a series of wooden paths that winds into the forest, lined with 40,000 tropical flora and fauna. Are your curiosity, imagination, and sense of adventure aroused? We hope so. If you want to learn more - much more - about this fascinating nation and its people, and taste its cuisine, you are invited to join us as guests of Ambassador and his First Lady on Wednesday, January 23, 2019. 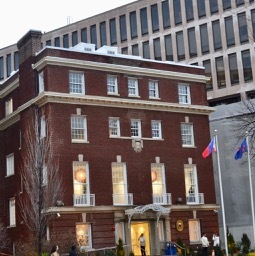 Our Embassy receptions usually sell out in advance, so sign up early to join us for this event. IMPORTANT: You must register in advance for security reasons and as a courtesy to our hosts. ... a total of 48 guests.